In 1920, the Blackpool and Fleetwood company’s running rights expired and were taken over by Blackpool Corporation. Blackpool Corporation inherited Blackpool and Fleetwood's 41 trams of various types including, box cars and toastracks, many of these cars being the originals from when the tramroad opened. The trams were renumbered into the Blackpool Corporation number scheme, with Box Cars 20-24 becoming 101-105, 14-19 becoming 106-111 and 38-41 becoming 112-115. The Yanks were numbered from 28-34 to 116-122. The Vanguards were numbered from 35-37 to 123-125 and the racks were renumbered from 1-10 to 126-135 and from 25-27 to 139 - 141.
replacing small wooden or brick built shelters. The track layout was changed at Rossall to eliminate a sharp curve. By mid 1920, work on enclosing the partially open sided Yanks to make them suitable for all year round service. The body sides had 12 windows per side added as side paneling added all along the body side. A number of Standard Cars were built over the next few years, beginning with Standard 28 and ending with Standard 177 in 1928. (The standard trams were numbered in-consecutively). Most of the Standard cars were built by the Corporation (with a few built by Hurst Nelson in Motherwell, the company who also built the Kilmarnock bogie trams for Glasgow and a number of the original vehicles for the Glasgow Subway). By 1924 Bold Street Depot in Fleetwood was closed and a loop was built at Fleetwood taking the tramway right up to Fleetwood Ferry and returning on to Lord Street by the shadows of the lighthouse. 'Deluxe' Car 68 was decorated and illuminated for the opening of Princess Parade during 1924 as well. It would go on to run as the illuminated 'Progress' car from 1925 - 1936. Sidings were built at Thornton Gate to receive coal wagons delivered by LNER. The coal wagons were hauled along the tramway by a small electric locomotive from a spur connecting the tramway to the railway line behind Copse Rd Depot in Fleetwood. The Electric Loco carried out this role until 1949 when the coal was delivered elsewhere, the loco then spent the next few years hauling the weedkiller truck and permanent way wagons up and down the line until 1963 when it was preserved. The electric Loco is now in use as a depot shunter at Crich Tramway Museum in Derbyshire. With more Toastracks needed for the Circular tour, Blackpool Corporation took the decision in 1927 to build their own Toastracks, 6 of these (numbered 161 - 166) were built and put into service. They didnt have a long service life, having been withdrawn with the outbreak of World War 2 in 1939. Of these, 161 found use as a snowplough and water car during the 1940's, 163 became the basis of the Blackpool Belle in the late 1950's. 165 and 166 became the unique television tram. 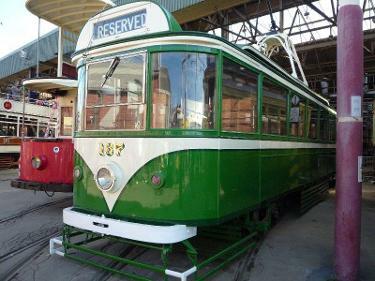 Following 165's withdrawal and scrapping, 166 was stored until 1972, when it was donated to the National Tramway Museum in Crich, where it has been restored to its former glory. 10 Pantograph cars were built for the North Station Route and delivered in 1928. They operated between North Station and Fleetwood and also on short workings to Cleveleys all year round before being relegated to seasonal work upon the delivery of Railcoaches to operate the route in 1934. These 10 Pantograph cars were unique in that they operated the route they were intended for when built and delivered, they only operated on the North Station Route and only ever strayed elsewhere on the odd private hire or tour and also when travelling to Rigby Road for repairs until they were withdrawn from service in 1961. The fact that their destination blinds only contained destinations on the North Station route may have had a factor in this. The Pantographs got their name from their method of current collection. The 10 trams were unique at this time on the tramway for using pantographs rather than trolleys. They did soon receive trolley poles as their pantographs caused havoc for the overhead line team who not only had to top up the grease trays, but also had to deal with problems caused by the grease being carried by other trams and ending up on overhead lines all over the system and even on the neighbouring Lytham St Annes Tramway. In the late 1920's, the tramline was extended southwards past the Pleasure Beach, along the South Promenade to Starr Gate, thus Lytham Road and the Prom were now connected in a third place, by connecting the prom line at Clifton Drive (One stop before the present terminus - Starr Gate) where the junction connected to the line along Squires Gate Lane towards Squires Gate and also connected the Promenade line to the St Annes Track.